PM Oli, Chairman Prachanda hold one-on-one meeting for four hours - Integration Through Media ....! 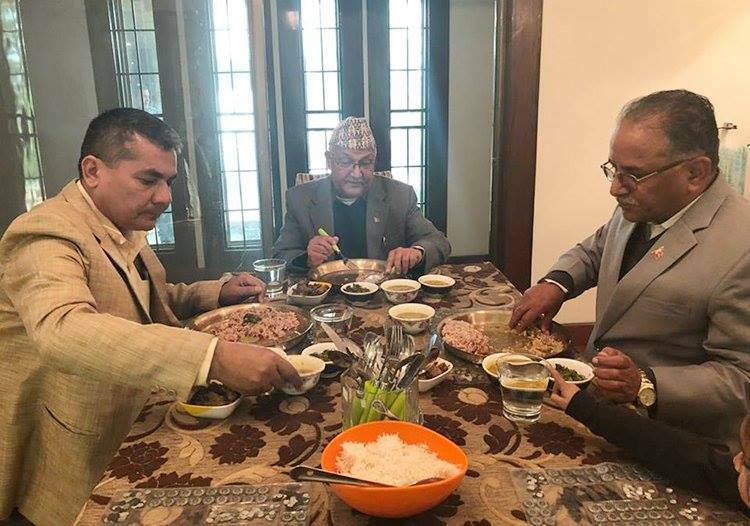 BHAKTAPUR: Prime Minister and CPN (UML) Chairman KP Sharma Oli and CPN (Maoist Centre) Chairman Pushpa Kamal Dahal ‘Prachanda’ today held a one-on-one meeting for four hours. The two leaders talked about party unification process, new party’s political guidelines and Maoist Centre’s participation in the government, according to Chetan Adhikari, press coordinator of PM Oli. Adhikari further shared that the meeting has ended positively and added that the party unification committee meeting will be summoned soon to conduct further discussions to forge consensus over the remaining issues. It is stated that the PM Oli had urged Dahal to send names of party leaders from the Maoist Centre to join the government as the ministers.